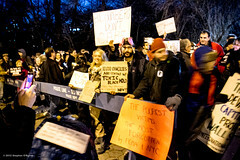 Residents and activists of Staten Island and the Far Rockaways protested outside Mayor Bloomberg's residence on Saturday night demanding that the city speed up recovery efforts and to also bring attention to the fact that there are still thousands of families living in mold infested homes without heat or electricity. Although the protesters were very vocal they were peaceful and yet the NYPD managed to find some reason to arrest demonstrators. SOBPhotography, “| Occupy Sandy |,” Occupy Archive, accessed April 20, 2019, http://occupyarchive.org/items/show/3565.